Simon Property Group (SPG) is America’s largest mall owner, with full or partial ownership interest in 235 properties across North America, Europe, and Asia. Most of Simon's locations are typically anchored by department stores, and the vast majority of net operating income, or NOI, is derived from the company's U.S. malls (50% of NOI) and premium outlet centers (30%), which are essentially groups of discounted luxury stores. As you can see, Simon has strong concentration in large and thriving states, including Florida (15% of NOI), California (13%), Texas (10%), and New York (7%). The company's premium super regional mall properties ("The Mills" - 11%) and International properties (9%) account for the remainder of income. Per Morningstar, there are currently about 1,200 malls in the U.S., broken down into four classes based on sales per square foot. In 2014 Simon decided to refocus its portfolio on 100% higher quality malls (Class A or B) and spun off its class C and D properties into a separate REIT, Washington Prime Group (WPG). This is why Simon enjoys arguably the industry's highest-quality property portfolio today with $620 average sales per square foot (compared to $570 and $562 for rivals Macerich and General Growth Properties, respectively). The REIT’s historical success has been due to management’s disciplined approach to slow but steady growth. Specifically, Simon Property Group focuses exclusively on high-end and ultra premium luxury properties (such as its “Mills properties”), with good diversification across the U.S. as well as with tenants. Simon Property Group’s largest tenant (The Gap) accounts for just 3.5% of its total rent for U.S. properties, for example. 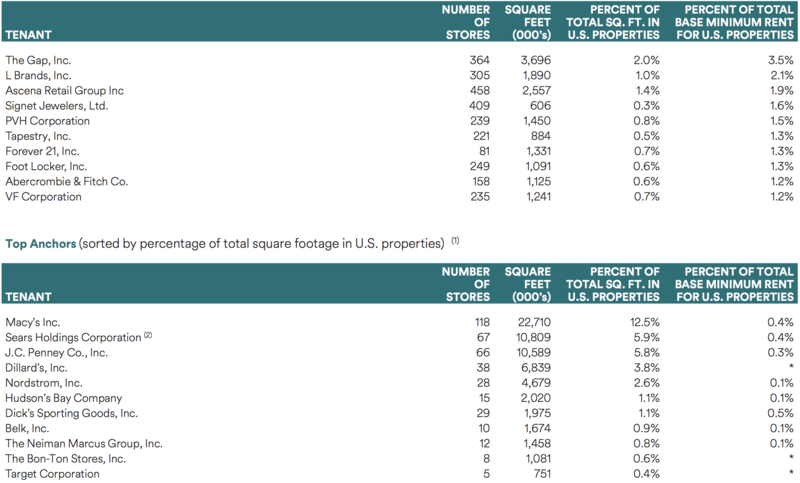 The malls the company owns are also reasonably diversified by anchor tenants with Macy’s representing the biggest share of square footage (12.5% of the total). This helps protect Simon Property Group from being overly exposed to the fate of any single retailer, which is important because brick-and-mortar retail is a notoriously tough business with a low survival rate for many companies (consumers are fickle). While lower quality retailers, such as those found in grade B and C malls, have suffered in recent years, Simon Property Group’s exclusive focus on the high end of the market has helped it to continue growing despite the rise of e-commerce giants such as Amazon (AMZN). That includes rewarding shareholders with double-digit dividend raises in recent years. Simon Property Group has managed to achieve impressive long-term growth thanks to several competitive advantages, beginning with its experienced management team. The company is led by CEO David Simon, who has held the top job since 1995 and been named "one of the best CEOs in the world" three times by Harvard Business Review and Barron's. But Simon's deep bench of managerial expertise runs deeper than just its CEO. For example, President and COO Richard Sokolov is a 21-year Simon veteran and makes most of the firm's investment decisions. Before joining Simon, Sokolov was with DeBartolo Realty Corporation (a mall developer) for 14 years, including two years as CEO before Simon purchased the company in 1996. Simon's second competitive advantage is demonstrated by its impressive track record of wise capital allocation decisions to drive profitable growth, especially with acquisitions (over $40 billion in total since going public) and foreign joint ventures. For example, in 2007 Simon partnered with private equity firm Farallon Capital Management to to acquire the REIT "The Mills" for $7.9 billion. This business specializes in super regional malls (mega malls of 800,000+ square feet of leasable space). In 2012 Simon bought out Farallon and now owns all of The Mills' 18 locations outright. In 2012 Simon paid $2 billion to purchase a 28.7% stake in Klépierre, the highly successful European mall REIT. Compared to the U.S., European regions tend to have less mature and more fragmented shopping centers, potentially making them more appealing for long-term growth. Over the years Simon has further expanded its overseas holdings, and today The Mills and its International portfolio enjoys some of the highest occupancy (over 98%) and greatest lease spreads (close to 20%) of any mall REIT in the world. Lease spread measures how much a mall REIT increases its rent on expiring leases. In other words, it represents the pricing power a mall owner has. A consistently strong and positive lease spread is often a sign of a vibrant mall, one with good traffic, high sales per square foot, and thriving tenants. Even in its U.S. malls, which are arguably under the most potential pressure and consumer shopping habits change, Simon has continued enjoying strong occupancy (95.6% in 2017), low double-digit lease spreads (over 11% in each of the last two years), and moderate gains in sales and rent per square foot. This is partially because, in addition to maintaining some of the most premium (luxury) malls in the country, the REIT has also be investing in non-retail assets. Specifically, Simon is incorporating more office space, apartments, and hotels into its existing properties, thus making its malls more valuable "experiential" locations. Simon's tenant base is also highly diversified (top 5 = 10.6% of U.S. rent) with very little exposure to deeply distressed department store chains such as Sears (5.9% of total square feet, 0.4% of rent), and J.C. Penney (5.8% of total square feet, 0.3% of rent). Thanks to its diversification and focus on more differentiated mall properties, Simon's cash flows have remained highly stable, which allows for a generous, safe, and steadily growing payout. For 2018 management expects Simon to generate 6.7% growth in funds from operations (FFO) per share, indicating another 6% to 7% dividend hike is likely this year. Over the long term, Simon has potential to continue growing its cash flow per share and dividend by around 5% annually. This is courtesy of the REIT's $600 million development pipeline, which it can easily finance using just its excess cash flow (after dividends and maintenance expenses). That's important because it provides Simon with a very low cost capital. Since REITs must legally payout 90% of taxable income as dividends, most REITs retain very little cash flow for reinvesting in future growth (usually 10% to 20%). This is why the industry offers high yields but is also marked by large debt levels and frequent equity issuances (selling new shares). Simon's guidance calls for about a 65% FFO payout ratio, meaning the REIT will be retaining about a third of its cash flow. This is sufficient to not only pay for the REIT's growth plans, but also to allow Simon to be one of the few REITs that has a share buyback authorization ($250 million). In other words, if the share price gets too low, Simon can buy back shares and thus further boost its cash flow per share growth. Impressively, Simon also maintains the strongest balance sheet in the real estate sector, which is why the company enjoys the only "A" credit of any REIT in America. This is due to Simon's very conservative use of debt. For example its leverage ratio (Debt/Adjusted EBITDA) is 5.5, far below the industry average near 8. This strong credit rating is why Simon has been able to borrow at incredibly cheap levels (average interest rate is 3.5% for average duration 7-year bonds). In fact, even in this rising interest rate environment Simon has been able to keep refinancing its debt. This means lowering its interest rates while also extending its average bond duration. For instance, in the fourth quarter of 2017 Simon issued two bonds totaling $2.7 billion, with an average duration of 7.9 years, at an average interest rate of just 3.07%. The REIT was also able to extend its revolving credit facility out to 2022, while simultaneously expanding it by $2 billion and lowering the interest rate. All told, Simon has $8 billion in available liquidity (cash and remaining borrowing power on revolving credit facilities). Overall, Simon's cost of capital is one of the lowest of any REIT in the country. And because its development pipeline is expected to generate 9% cash yields on investment, Simon should continue enjoying one of the highest spreads in the sector. Overall, Simon Property Group appears to be the undisputed leader in its industry and enjoys major competitive advantages in terms of management quality, cost of capital and profitability, and a decent growth runway that it can finance with zero dependence on fickle equity markets. In other words, Simon Property Group is one of the few REITs whose growth potential is fully within its own control. Simon Property has done an admirable job of successfully adapting to rapidly-changing industry conditions over the decades. However, there are two risks that could still challenge the REIT and result in slower than expected future growth. For one thing, Simon does have significant exposure to some struggling retailers, including top tenants The Gap (3.5% of U.S. rent), Abercrombie & Fitch (1.2%), and L Brands (2.1%). If they end up closing stores, then Simon's occupancy rate could temporarily decline as it has to find replacement tenants. However, this would likely be just a short-term hiccup for this highly diversified mall giant. A potentially larger risk is that the increasingly omni-channel (mixing retail and online sales) focus of its malls and tenants might result in physical store locations (the REIT's historical strength) becoming less important in the future. Specifically, the concern is that if retailers focused more on online sales, with physical stores serving merely as pick up points, then many of Simon's tenants might not be willing to pay the higher rents that the company has been so good at extracting. This could be a reason that Simon's U.S. Mall occupancy rate has been edging lower in recent years. While Simon's occupancy remains strong near 95%, many of its rivals have found that in order to maintain occupancy they've had to offer more concessions on rent, resulting in declining lease spreads. Building new malls is incredibly expensive and time consuming as well, and in the U.S. the market is already oversaturated. For example, according to Credit Suisse, by 2022 about 20% to 25% of U.S. malls (representing over 1 billion square feet of leasable space) will close. Simon's U.S. Mall business' primary growth catalyst is strong occupancy, courtesy of good traffic that allows its to continually raise rents and thus maximize cash flow from its existing asset base. With pricing power potentially shifting more towards tenants in the future as shopping becomes an increasingly digital experience, this might spell slower growth for Simon's cash flow and dividends. 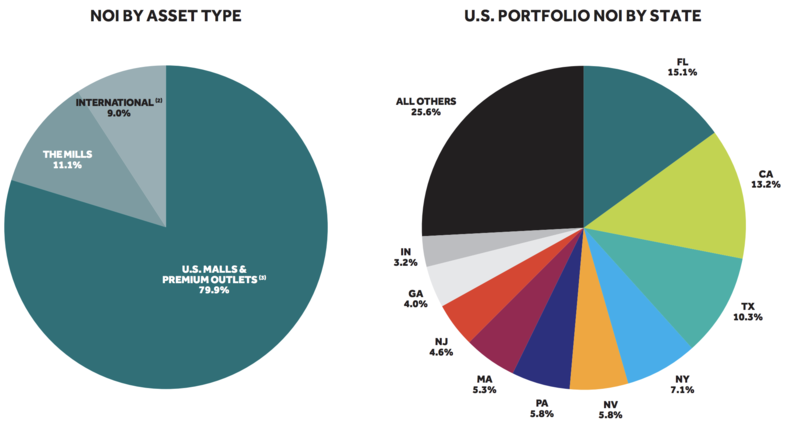 The REIT has had good success with outlet centers, which make up about 30% of its income. However, this success has largely been from stealing market share from traditional outlet centers (located outside of cities). Basically, Simon managed to offer a more convenient outlet mall experience by locating its centers in urban locations, including sometimes in its existing malls. But with online sales offering the greatest convenience of all, it's possible that Simon's success may not be repeatable in the future. As for its non-retail properties? While those add some much-needed diversification, management expects non-retail to mainly serve as a value-adding feature to continue driving foot traffic at its existing malls. In other words, these properties will never make up the majority of the REIT's income. All of these risks put together mean that Simon is essentially the highest quality operator in an industry that's suffering through large-scale disruption, and thus the company might end up proving to be "the nicest house in a bad neighborhood." While the firm's premium locations and skilled management team are likely to allow Simon to outperform far better than most of its mall rivals in the coming years, it's also true that investors can't expect Simon's strong double-digit dividend growth to continue given some of the growing industry headwinds. Simon Property Group has proven to be an excellent long-term income growth investment thanks to the company's disciplined and adaptable management team, strongest balance sheet in the sector, and low-cost growth capital. Simon's future looks the brightest of almost any mall REIT, but investors need to remember that it's quite possible that continued changes in consumer spending habits will make it much harder for the company to recreate its past successes. So while Simon appears to represent a potentially decent high-yield value investment today, interested investors must understand and be comfortable with the real long-term growth risks the company faces as the industry evolves. When dealing with businesses facing a wider range of potential outcomes, it's especially important for investors to maintain well-diversified portfolios with reasonable position sizes to minimize company-specific risks.